Medicines produced using genetic techniques have existed since 2006, called “similar biological medicinal products” or “biosimilars”. Until a year ago, this was a fairly low-profile group, even in expert circles. This has all changed now, however, with the recent licensing of the first biosimilar antibody. Physicians and patients are understandably concerned: the question suddenly arises of why we use the term “biosimilars” and not “biogenerics”. Are there problems lying in wait for us here? To simplify matters, our cornucopia of medicinal products can be divided into three categories: i) natural substances; ii) chemically synthesized medicines; and iii) medicines made using genetic techniques. While most natural substances and all chemically synthesized medicines are relatively small molecules, medicinal products made using genetic techniques are colossal in comparison. They are in fact so large that they can no longer be made profitably by chemical synthesis. Instead, the task of producing these medicinal products – also known as biopharmaceuticals – is handed over to the biosynthetic apparatus of a living cell. Following the expiry of patents on some biopharmaceuticals, it became theoretically possible to develop “generic” medicines equivalent to these very expensive medicinal products. Yet it was always very clear that the methods used to develop and license typical generics cannot be used for these kinds of products: unlike chemically synthesized active substances, the structure of a biopharmaceutical is considerably more sophisticated. Biopharmaceuticals always consist of a long chain of amino acids that are chemically linked by means of relatively unstable peptide bonds. In addition, the function of these molecules depends on the precise folding of these chains. Only one of countless variations in folding states supplies a biologically active protein, and this structure is not stabilized by fixed chemical bonding, for example, but instead by “weak interactions”. As a result of these unusual structural details, biopharmaceuticals present us with a set of problems quite unlike those encountered when producing chemically synthesized active substances. Indeed, biopharmaceuticals always consist of a complex mixture of a variety of molecular forms. A protein that we choose to isolate from blood, for example, would logically also exhibit this kind of heterogeneity. For a medicinal product, however, steps must of course be taken to ensure that molecule variants, while unavoidable, must be kept in a constant ratio to one another. Performing analysis to characterize a molecule mixture of this complexity would have been unthinkable a few years ago. Pharmaceutical companies handled this dilemma by precisely describing (specifying) the manufacturing process in all of its detailed steps and then ensuring meticulous compliance with these specifications. The result gave rise to a new paradigm: “The product is the process.” This remains true today for all active substances made using genetic techniques. In the meantime, bioanalytics has advanced by such leaps and bounds that it can be described as an “analytical revolution”. Today, even biopharmaceuticals as complex as antibodies can be analyzed in terms of their chemical and physical properties down to the very last detail. This, in turn, was the precondition for being able to copy patent-free biopharmaceuticals. While the paradigm of “the product is the process” continues to apply, the process in question is not necessarily the manufacturing process of the original manufacturer. What is crucial is that the original manufacturer’s molecule (reference medicinal product) and the generic product (biosimilar) are similar enough in terms of their structure and complexity of detail that no differences in terms of efficacy and tolerability are to be expected. An exact copy of the original? Put simply, a biosimilar is a “copy” of a biopharmaceutical (reference medicinal product) that has held marketing authorization for several years. Since biopharmaceuticals always exhibit a certain degree of molecular variability, a biosimilar may not actually be structurally identical to the corresponding reference product. Inherent and unavoidable structural differences exist even between different batches of the reference medicinal product . These differences are minor, however, and their magnitude is strictly limited by upper and lower specification thresholds. This also applies to the minimal structural variations between the biosimilar and the reference medicine, which are also prohibited from affecting the safety or efficacy of the medicinal product. Evidence for this must be supplied during the authorization procedure. These data are examined by the EMA, and the European Commission grants European marketing authorization if the EMA’s verdict is positive. This authorization guarantees that the biosimilar is just as safe and effective as the reference medicine. 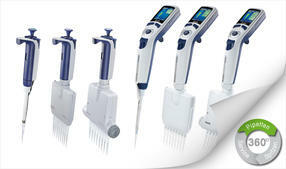 The biosimilar is always used to treat the same medical conditions as the reference product and at the same dose. Equally, precautions that must be observed when taking the reference medicinal product will generally apply when taking the biosimilar. 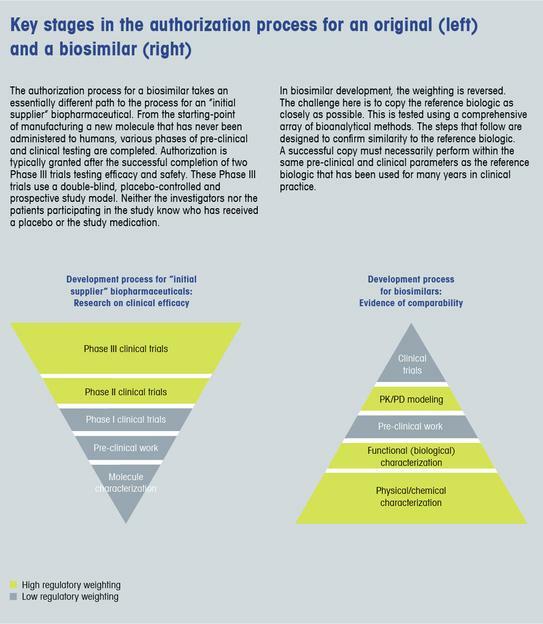 The development of a biosimilar is essentially a threestage process. 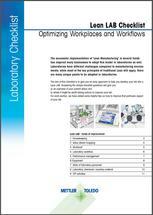 The first step is to apply the full extent of the bioanalytical art to characterizing batches of the reference biologic obtained worldwide. This analysis will also reveal that the active substances from separate production batches of the originator biologic are by no means identical, and will instead define the upper and lower limits for each individual analytical parameter. The biosimilar manufacturer uses the results of this analysis to define analogous specification limits for the new product. This is a major challenge: these limits must correspond as closely as possible to those of the reference product – but these are unknown. The last step is to develop a manufacturing process capable of producing a protein that satisfies all of the prescribed requirements. This protein is then extensively analyzed – including its efficacy and tolerability as part of clinical trials. 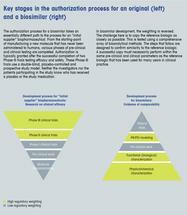 Ultimately, the manufacturing of a biosimilar is no more and no less than the copying of a complex molecule. To better understand the principles, we can illustrate the procedure once more by applying a metaphor. Let us say that our task is to (legally) copy a designer chair. 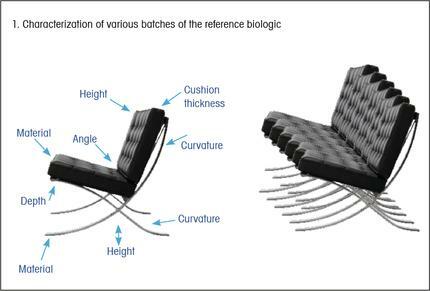 The first step is to obtain a full set of specifications for the chair, as well as possible deviations in the specifications exhibited from chair to chair or between chairs from different production facilities. A comprehensive analysis and description of all relevant properties – such as the nature of the various materials used, the dimensions, complex material curvatures, color, haptic appeal, etc. – from many chairs is an essential step here. After all, it’s an unavoidable fact that copies can be 100 % identical neither to the original nor to each other. Even when high-precision tools are used with automated production machinery, minor deviations of a few millimeters or so will nevertheless be unavoidable. Accordingly, certain margins are defined for all key properties (specifications) with the aim of most nearly approximating the permitted variance as defined by the manufacturer for the original product. Even the original product’s separate parts (the molecules, in the case of the biosimilar) cannot be produced identically from batch to batch. 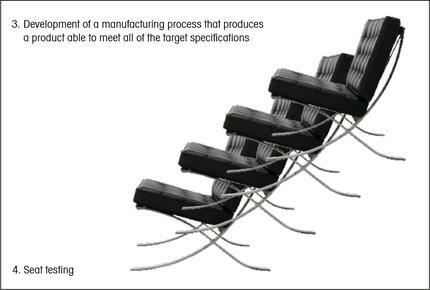 Once this approach to manufacturing chairs has been adopted, a detailed documentation of the design and production process is submitted with a sample to a regulatory authority that is conversant with the original in every detail. If the regulator considers the production method to be sound after conducting extensive testing, this certifies the copy as being equivalent to the original and asserts that one can expect the copy to behave in the same way as the original. Back to our biosimilar. After producing the reference biologic variant, the biosimilar manufacturer must now submit a Marketing Authorization Application to the EMA. When checking these data, the regulator can draw on a very different set of documents than the biosimilar manufacturer, however: while the latter has no direct knowledge of the reference biologic, the EMA is familiar with every detail of the original medicine. The EMA’s evaluation procedure is uncompromising! Only if a biosimilar can demonstrate without a doubt that it is equivalent to the reference product not just in terms of efficacy but also in terms of quality and safety is this substance then granted an EU marketing authorization. Unsurprisingly, not every biosimilar candidate is able to meet these stringent standards. The answer to this is a resounding “No.” It’s important to remember that a biopharmaceutical declared as “biosimilar” has itself been granted a marketing authorization by the EMA. Only authorized medicines can be marketed in the EU, since only these medicines have been compared to the reference biologic by applying a set of stringent and transparent standard criteria. First publication: Dingermann, T., q&more, 1.2016.